Kangkung, also spelled kangkong belacan is a common dish in Singapore. This dish is easy and simple to make. 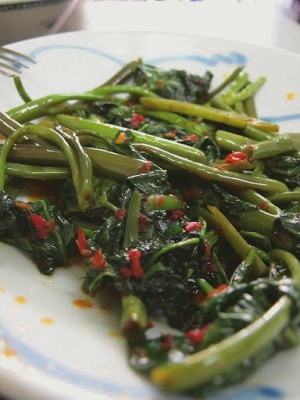 Kangkung Belacan is a classic Malay recipe stir fried with spices and served hot at dinner! Put the cooking oil in a wok over medium-high heat, add the spice paste and cook for 3-4 minutes or until fragrant. Add in Kangkung, and stir-fry at high heat until well mixed (This should take less than 2 minutes!). Do not over-cooked! Kangkung tend to softened very fast. Searve hot over steamed rice and bbq fish. kang-kong must eat almost immediately. if not, it will turn dark. this vegetable is cheap. i think 1 kg only 1$.